WE ARE CLOUD 9 TOYS. WE’RE KIND OF A BIG DEAL. 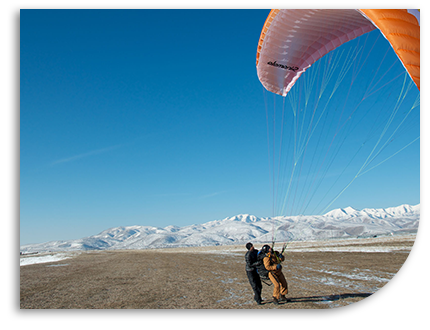 Cloud 9 Paragliding has the privilege of teaching at the premier training site in the country: The Point of the Mountain Flight Park in Salt Lake City, Utah. Pilots come from around the world to experience the smooth air, predictable weather and consistent ridge-soaring conditions at the Point. In the mornings the wind normally blows from the south, so most lessons are taught on the South Side. In the afternoon, the winds normally switch to blow from the north, so we fly our PM sessions on the North Side. Both sites are stupendously convenient, with spacious parking lots, room for tent camping, food and fuel close-at-hand and drive-up access. (The latter is, as seasoned pilots will tell you, a huge bonus: no hiking the hill for each flight!) Due to the unique conditions at the Point of the Mountain Flight Park, flights of several hours are very common here. Cloud 9 students get a special rate when they book the local Ramada Inn Draper, Ut for their visit to Salt Lake City. The first area you'll pass as you go through the parking lot is the Hang Glider set-up area. Proceed past it to the next area, which is the Paragliding area. Park and look for the Cloud 9 logo -- or you can ask for us any Point local can point one of us out. Welcome to the South Side! Google Maps Driving Directions to both the North Side and South Side of the Point of the Mountain.